Australia may not be anywhere close to being GM’s biggest market, but at the same time, it holds a few exclusive and coveted vehicles. And while people of Oz may refer to one of their gems as the Holden Commodore, we Americans all-too-briefly knew it as the Pontiac G8, whereas Great Britain recognized it as the Vauxhall VXR8. Sadly, those days are gone. Soon, however, the United States will get re-acquainted with Australian culture in the form of the Chevrolet SS, which will be a high-end derivative of the upcoming Holden VF Commodore sedan. But as many of you readers know, the Commodore also comes in sport wagon and ute variants, and not just a domesticated four-door. This is where things get interesting. While we don’t know outright if the same plans are in store for the Chevrolet SS, we do know the following: General Motors filed a trademark application with the United States Patent and Trademark Office on May 22, 2012 for the “Nomad” name — a moniker that was a rear-wheel-drive, V8-powered Chevrolet station wagon from a few decades ago. So even though we have yet to hear official confirmation from The General, evidence is beginning to mount that the U.S. market is in store for a Chevrolet that can lay down fast lap times as well as it can carry $400 of groceries from Costco. This latest word should help heal the wounds from the news that the Cadillac CTS Sport Wagon — and thus the CTS-V Sport Wagon — is being discontinued. Indeed, a new Chevrolet Nomad would be quite a treat for enthusiasts, and will hopefully turn more consumers to think differently about station wagons. Another thing we await is the return of the Chevrolet El Camino — which has been rumored to be coming back for a few years now. Can’t say enough how beautiful this car is to my eye, though my interest would be for something practical (Voltec) rather than a gas-guzzling SS. Hope this is what Reuss has in mind for the Nomad. Looking forward to mid-January. Just wishing out loud here. But a re badged HSV Maloo would be a killer El Camino SS. Chevy could have a very limited release of say 2000-4000 units. For the very lucky few. Or just start a separate SS division. ( that sounded awkward in a Historically negative way if you are not thinking Chevy) my apologies. Nothing huge but in the sprint like SVT and SRT. How awesome would that be for a Chevy fans! How about this one? And Nomad has been a 4 door also. AND it has been a van. and have razor wire around your place…. they believe we’re in the sixties all over again. Look around you – we’re a nation literally “owned” or “pwned” – (as the youngsters call it) by anti-democracy nations who sit on top of loads of dino juice that we NEEEEEED to power …uh, these SSs. gearsets or slush box to shift down. the yeoman’s work of daily use. you lusted over in high school….y’know? that are more efficient – do more for less, have higher quality, are safer and last longer. Sport model garage queens do not make a company escape bankruptcy. GM has enough “halo” cars already – they must concentrate on mainstream big sellers. Do you seriously think that the above mentioned SS cars if built today would have monster V8’s? And would be gas hogs? I dont know about you but I live in a world of turbocharged 4,6and 8 cylinder engines. Turbo 4’s put out large v6 numbers and turbo 6’s put out V8 numbers with Very GOOD gas milage. ect..and for your information I was in Iraq fighting for your precious oil so don’t presume to lecture me about Sacrificing. You Sound like a tree hugging hippy who opposes any form of Confrontation especially at stoplights. Buts that’s for a different website. Now I do agree in electric power for cars, and new hybrid sports cars, the Porsche 914 and new Acura NSX comes to mind but could you afford one? The Honda CRZ is a good start but when a Toyota Camry can eat your lunch not such a hot car is it? And the Hyundai Veloster turbo Is more powerful and has better gas mileage. But in time they will come down in price. Also your right This is a site for car enthusiasts. GM Enthusiasts, And this post is for Chevy enthusiasts. Enthusiasm seems to denote excitement for something. I have grow up to Appreciate performance in my automobiles. Ford seems to be think Performance is okay for their main stream automobiles look at the ST twins and SVT dodge with the R/T cars And SRT lets see theres AMG BMW M the S line for Audi. TRD for toyota. Nismo for Nissan Abarth for Fiat, STI for Subaru SS for Chevy, F sport for Lexus I could go on….so yes there is a market for performance cars. you want to go ahead and save the planet go ahead and drive your Prius I’m sure there’s a automotive website for hippies. in one of the hottest market segments there is – midsize sedans. system can only match Ford’s base 4 cyl. gas mileage for Fusion. month “refresh” of Malibu proves I’ve been right all along. off the Chicken Tax bandwagon and will give us efficient vans. built in the USA ( due to Chicken Tax ) to be profitable and …. it’s a RENAULT!!!! ICK!!!! This equals – not good. Voltec CUV designs it’s had since 2009 but will not build ( MPV5). sales!!!! Face it, GM is getting their arses handed to them. today, the beancounters and old-thinkers are ruling the day. GM is in trouble folks — big trouble. I wouldn’t be buying any stock. …. AN ELR?!!! – This is just not smart thinking at all. path and no sporty niche models will bring them back. Sounds like we have ourselves a Ignorant Ford guy here doesn’t it…. But he can’t help himself there is no treatment for Trolling…. Sorry for the lengthy writeup, but it must be said. Go to YouTube and watch Tesla Roadsters whip Porsche Turbos. Europeans for 19th Century, explode and bang tech. bread-and-butter, and this is my ENTIRE POINT. Can you afford a Tesla? Probably not……..and I rest my case. and I do own an American made Volt. – HOW ABOUT THAT?! upon year ) largest supplier of imported oil. In 2009 they reached PEAK PRODUCTION, meaning every year since we’ll see less and less oil from their wells. It’s the same world over. Conservatives who preach “energy independence” – or 2008’s “drill baby drill!” are stupid or just greedy and lying to you and I. Data is readily available that shows you that if we drilled the entire USA from N. Dakota to the Gulf of Mexico, to the shores of California to the pristine lands of Alaska — we still would only be putting a 20% dent in the oil we use today. Since oil needs rise each year, this makes no sense. Getting that oil doesn’t happen overnight – it takes 5 – 9 years to get this in place. It’s a losing battle – we’re running out of oil – it’s non-sustainable. Tip: Don’t listen to politicians. is far more polluting and innefficient than even the dirtiest coal plant – to wire to wheel. Thats all fine and dandy so lets say I do and can afford a tesla. Problem 1 There is about 1000 miles to my nearest tesla dealer. So I go fly to them because I’m rich ? Problem 2 So I buy one everybody is happy and crap 200 miles later I’m the middle of nowhere without any were to charge… Lets say I plan ahead and stop for 8-12 hours every 200 miles to recharge until I get home.. Talk about a long trip. And this is my point. Once the infrastructure is in place the no problem. But it’s not and until that day is is gasoline is with us……so Instead i buy and drive a car with a 450 mile range and fill up twice takes about 6 minutes tops. Oh wait there are various car dealers of all sorts of brands with in a 15 mile radius….Bonus! Manoli good article and to all the other writers there is more to the story than just SS there is a resurgence going on within GM and I am very proud to be associated with a company going through many good changes. we know the history of the SS and are treating the future of the mark very carefully and this includes some other iterations of product that the general public hopefully will enjoy. Those days in GM were some of the best and we want to get back to them. As you know we have trademarked many older past names of our cars and you may see some or all on product as we try to get back what we once had a great and diverse product range, there will be some misses like the Malibu and this miss in my eyes is like hitting a bullseye and inch off center, the base car is great it is the details some do not like we will work on that. I will guess that all will like what is going to be released and shown in concept form and production form, there will be alot of suprises but the article is a really good guess. Tesla is bringing 800 of them back, and more to come. folks this current administration is trying to tax up the yang. entry-level Corvette to 2013 Cadillac ELR range. compare the guy to great American inventors like Edison, Henry Ford, or …perhaps…Nikolai Tesla himself? Enteprenuer, Rocketman, Electric Car Rogue? car from him, your fillups are free! Electric Car”… If you are brave enough to watch these films they will change your life. with the changes and embrace change for the better. showrooms in shopping malls and city centers. So everyone is near a “Tesla Dealer” because you can view a car at your leisure when you can and then order it online or by phone to be delivered personally to your door wherever you live in all 50 states. The delivery price is baked into the MSRP. I have to work. But it was nice sharing these facts with you. @Archangel you sure seem to be a magnet for debate don’t you agree? Just kidding, I agree with you mostly but we all are entitled to opinions right? I was sure he was a Ford guy. Can we just go back to discussing the potential arrival of the Holden V8 Wagon…..
I’m no Christian or Hippie James, but will pray that its released to the General Public rather than just Police Departments. When do the order books open? I can’t believe how excited everyone is getting over a bland-looking station wagon? That’s what makes me facepalm. 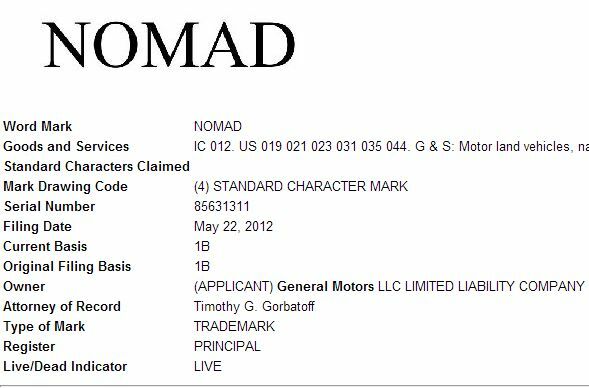 GM registers the ‘Nomad’ nameplate. Everyone loses their minds thinking it will be Zeta based, fire-breathing SS monster that will decimate Ford. There isn’t even a damn picture of anything! Wasn’t Pontiac going to have G8 El Camino and maybe wagon before the 2008 crash? I can only state my car likes. I would rather have a wagon than an SUV. I don’t plan on going off pavement. I would rather have an El Camino than a pickup. I’m not a contractor and don’t haul a lot. But again, just my preference. Have only owned GM vehicles 30 years.There is Blazer Xtreme, 2wd & 4X4 S10’s, and HHR in the driveway. I’m about 75% of my way through my restoration of a 1956 Chevy Nomad (LS engine, etc). Maybe we’ll launch together!